Enjoy the peace and quiet of the countryside on our beautiful site within walking distance of Porthleven and the spectacular Cornish Coast. 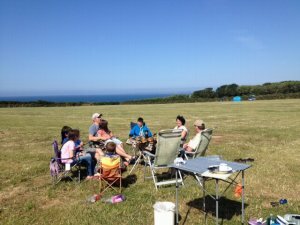 Enjoy the wonderful walks around Loe Pool, Penrose Estate and the Coastal Footpath by camping at Higher Penrose Farm, situated between Helston and Porthleven on the B3304 (for map click on "Location"). The site is open during July and August only. 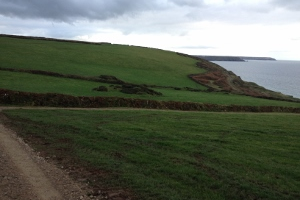 The site is 5 minutes walking distance to the Coastal Footpath leading to Loe Bar and Porthleven Beach. Hot showers, flush toilets with wash basins, and washing up facilities with hot and cold water on site for washing up your dishes. Camp fires are allowed. There are facilities to freeze your freezer packs and electric points are available for charging shavers and mobile phones. Well behaved dogs are welcome. Please note Caravans are not permitted. £7 per adult per night / £3 per child per night (under 16 years). HOT SHOWERS INCLUDED. Offsite Facilities - Porthleven is under a mile from the site and is a very picturesque fishing village with a sandy beach. Surfing is popular in the village (for the more experienced surfer). The village has a local Supermarket, Bakery & Fishmongers, Bar/Pubs, Restaurants, Takeaway Food, Post Office, Fishing & local craft market during the summer. Golf Courses at Mullion or Praa Sands. Horse Riding at Cury or Mullion (approx 5 miles away). Water Sports at Marazion (about 7miles away). Martin and Lisa will make your stay enjoyable.